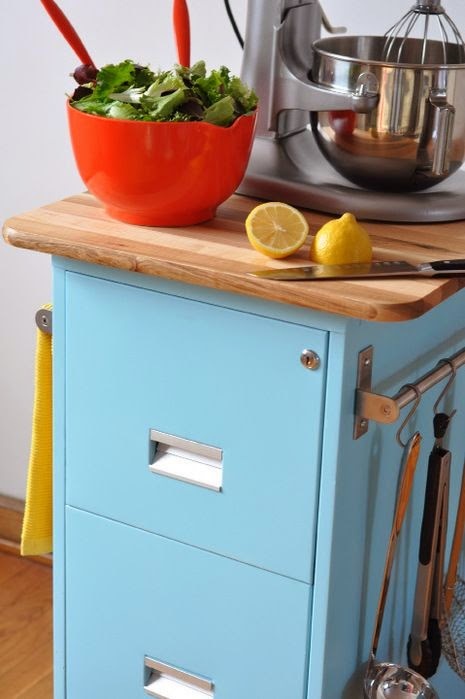 Jode Designs: Think outside the square.. Fabulous filing cabinet.. Think outside the square.. Fabulous filing cabinet.. IDEA ONE: Add a little fabric.. Covering your filing cabinet with fabric not only looks gorgeous but it also softens the hard edges of the steel corners.. Again the patterns are endless.. You can choose one to hide the filing cabinet or choose one which makes a feature out of it.. Enjoy.. IDEA TWO: Make a desk out of them.. 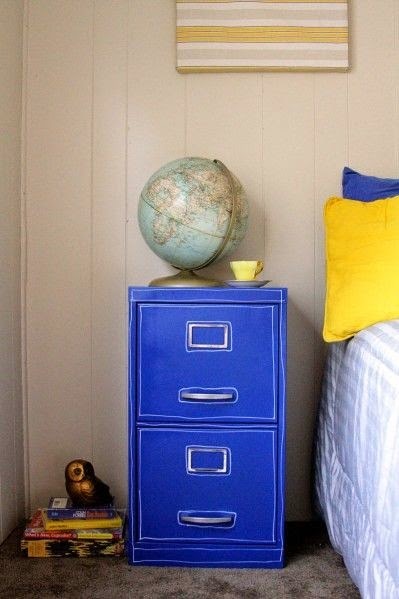 This is a fantastic idea.. You could use wooden or metal filing cabinets.. Add a timber or glass top and whoa-la!! I love the way the filing cabinets are painted and given a shabby chic look.. 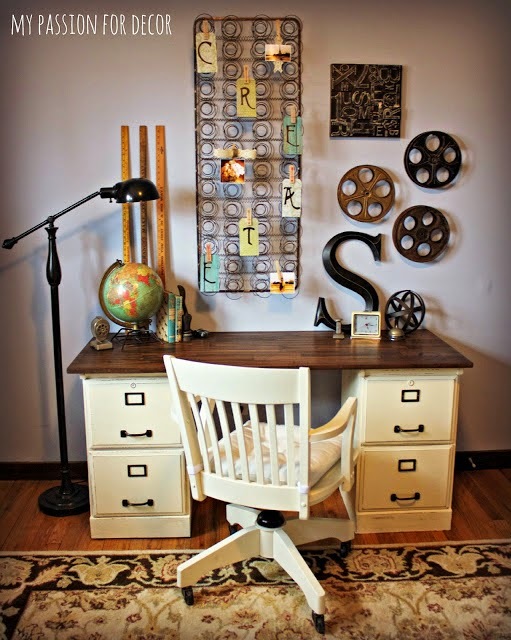 If you are using metal cabinets you could just leave them as is and make a feature out of the top of the desk.. Or you could mix it up with the other ideas below!! Enjoy.. IDEA THREE: Paint it with chalkboard paint.. So did I tell you how much of an obssession I have with chalkboard paint? 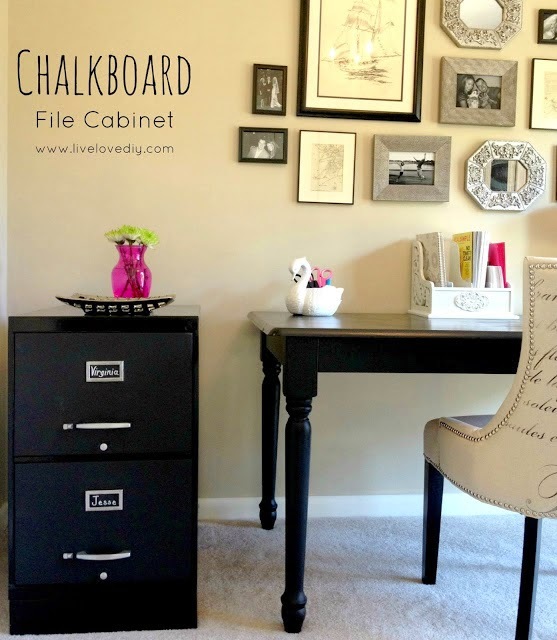 (I seriously have a problem) but look how stylish this chalk board filing cabinet is?! And also great for writing appointments or reminders on!! Enjoy.. IDEA FOUR: Add some texture.. Decorating a filing cabinet with texture will not only add comfort but can transform the look of a 'filing cabinet' to a 'piece of furniture'.. You could use textured wallpaper, fabric or you can be that extra inventive and use pressed metal panels.. And what a transformation you will make! Enjoy.. IDEA FIVE: Make it something else.. So what if you have an existing filing cabinet but you no longer use it? Well here is two ideas on how to transform it into something else..
Firstly, add a little spray paint and a little imagination and you get a funky bedside table.. This one is great for a boys room but you could certainly style yours to suit your room décor.. Enjoy..
Secondly, make a rolling kitchen cart.. Kitchen carts are an expensive but very useful item.. This idea will definitely cut down the price and will be a very sturdy and stylish item in your kitchen.. Enjoy..
As the leading suppliers of high quality commercial cleaning equipment, such wet dry vacuum cleaner and Janitor cart, as well as the distributors of quality office equipment, such as filing cabinet and storage Locker; we take immense pride in our unmatched ability to provide our customers with the most extensive selection of products in Australia. What sets us apart is our unwavering commitment to offer outstanding quality and unbelievably low pricing for all our products. All you need to discover some great savings is to browse through our range of top-notch products.